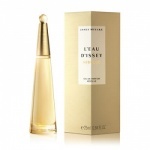 Issey Miyake invites us to discover the emblematic flower L'Eau d'Issey Absolue emblematic flower;Issey Absolue emblematic flower: The Night-Blooming-Jasmine. Cloaked in light during the day, this precious flower opens and shines only once the sun has set, leaving in its trail the scent of its secret. A floral bouquet with reflections of GOLD, INTENSE and LUMINOUS.